"The hot rod inspired Forte is built on a newly designed chassis, delivering consistent performance, time after time.The all metal body features a built-in razor sharp 7mm cigar punch so you can always be prepared when the moment calls for a cigar. Designed for the on-the-go lifestyle, choose your style." 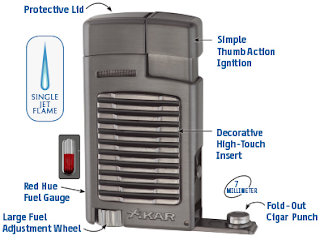 I Have not had a chance to get my hands on the New Forte by Xikar. My first impressions with out my standard hands is that this hits all the CLR hot buttons in a good way...almost. Has the bill fuel gauge wheel, cigar punch cutter, red hue for easier fuel level reading, and single thumb action. Aesthetically, the Forte is very appealing and without losing functionality. That said, it is a single torch lighter, with a suggested retail of $69.99 and $79.99 depending on the version desired.